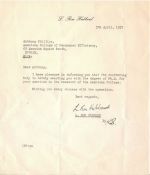 Letter making me a "Doctor"
I WAS DR. PHILLIPS Director of the American College of Personal Efficiency in Dublin, Ireland, from March 1957 to September 1957. This period had its good side and its bad side. The good side concerned the teaching of the Personal Efficiency Course, teaching the basics of Scientology (Cycle of Action, Tone scale, ARC and communication, stable data and confusion), in a week's evening course for people who had no knowledge of Scientology. The method of teaching was marvellous (later it was stopped, probably because it required some expertise), the aim was to get people to use these basics in improving their every day work, family and general life. I got my first big reality on Scientology's workablity from teaching that course. I regard the method he evolved for teaching, "teaching by agreement", as one of many strokes of genius which Ron showed, most of which have ended in the waste basket, probably because either new things came up, or the people using them were not capable of it (perhaps because their environment was too enturbulated). I traveled to Dublin in the night train to Holyhead, and a boat. A dreary journey. Arrived at Dublin's harbour about six or seven on a Saturday or Sunday Morning. I was met by Chris Morris, who took me to the place where I was to live. It was the first time I had been outside of British territory, but fortunately they spoke English. The only unusual thing was they did not eat marmalade at breakfast, just any sort of jam! My knowledge of the Dublin Operation was confined to what Ron had written in his PAB "The Open Channel" (PAB 79, 10th April 1956) and his conference lecture (the one that had inspired me!). I found we indeed had sumptuous premises (though barely furnished) at Merrion Square - the whole ground floor consisting of two large course rooms (with high ceilings), and a little registrar's office at the back. I did not know anything of the details of Ron setting up what was called "the Dublin operation", which in itself was unusual for that time, as there were only two, relatively large, Scientology Orgs (London and Washington DC) plus something in Berlin and Paris which appeared as though they were more like field auditors who had gotten their names on the lists of official organisations because of being in important towns in continental Europe. I was told that Dublin had 25% unemployment. I knew (and know) nothing about how Ron had started the operation or who had been helping. I knew that there had been an HPA (professional auditor course) while he was there, and from that there were two graduates outside the org, Bernie Green and Gerry Boland (with perhaps their wives, and in the org were Nuala Cowley, who was registrar in the evenings, and Bernard Duffey, who was evening Advanced course instructor. That was about all I knew of what Ron had started, described with enthusiasm in his PAB and lecture. My experience of business, was as a very junior optician in training. How you communicated to a hospital in Chicago, interviewed prospects for a nursing job or handled a newspaper to which you owed money - these were areas where I totally lacked experience, and was hampered by a very low level of communication. What did I do in my spare time? I worked in the afternoons (I can't think of what I did) and ran the course in the evenings. That meant I had mornings and weekends free. I must have spent a lot of time worrying! I can remember that somehow someone from a restaurant contacted me and offered me cheaper lunches if I ate there. I did so, and always felt guilty about it, and wondered if they would remember me, and generally was embarrassed (low communication level). At that time (see IVy 47 first article) there seemed to be a strong interest in science fiction, which I shared. I found a shop where you could buy a science fiction magazine (dog-eared and second hand) and could then exchange it for a small fee for another one when you had read it. I read many. Also, as a professional auditor I received fairly frequently Professional Auditors Bulletins (PABs) and I can remember one which puzzled me rather much, due to my training as an optician. Ron stated that we looked at things from metal plates in front of our eyes! (if I remember correctly). I suppose a fair amount of my spare time was spent composing the weekly report sent to Ron and Jack Parkhouse, my immediate senior in London. The keynote of all those reports was to get someone to relieve me of my post. These pleas got answered in a rather oblique way, for in those days auditing was regarded as the answer to all. On two different occasions an auditor was sent to audit me from London. Once it was Cyril Vosper, another time Darrel Sykes. With both of them we did objective processes (very sound in my case state, if the auditor had been good). On one of them I can remember Cyril did open air processing, we walked around while I spotted things and he seemed more interested in what was going on on the opposite side of the street. In the case of Darrel, he ran CCHs, which were very new at the time. I think rather mechanically, at any rate neither of them seemed to make any difference. I believe it was Darrel who eventually relieved me, and under him or his follower the operation was eventually closed down. When I arrived there was big talk and expectations because we had a preclear which I was to audit. It turned out to be a mentally retarded boy of about 15 or 16. He was quite a large boy, and it was an interesting sight to see his father delivering him for auditing, sitting on the crossbar of an ordinary man's bicycle. I was set to run objective processes on him, a sort of mimicry touching each other's body parts. I did not have much of a clue, and eventually the auditing was stopped. One of the ideas for financing the place was that we would of course get preclears from the course students. As I had no salesman knowledge, and no confidence in my auditing, that was the only preclear we got. In September relief came. Darrel Sykes came out to relieve me, and I returned to London and a job. For I became a HASI staff member, at 37 Fitzroy Street, near Tottenham Court Road in London (long term goal). I suppose these were jobs I could manage, so was not so unhappy. It was also nice to be in an organisation where I was in a junior position. I got to begin with £8 a five day week, and did not have money problems, or the need to "moonlight" (do other work in spare time to make ends meet - a term which came into prominence later). The title struck me as odd at first since we had nothing to do with ships, but you got used to it. Shipping covered the dispatch of Scientology books. Orders, with a check, I suppose, came in with the post, and we were supposed to get them out within 24 hours, which really meant same day. There was no problem with this. In those days membership of the HASI was taken quite seriously, there was a definite fee for memberships, and apart from (possibly, I am not sure) a discount on auditing (maybe that came later) one received Certainty Major (the British Scientology magazine, rather well printed, and Ability Major (the American magazine) which to my mind was very amateurish in comparison. Those in the USA were treated similarly, and I therefore had membership records for the whole world. What I remember (how well?) was that three quarters of the addresses were USA and three quarters of those were in California. In those days Scientology had a tape library, which I was responsible for for Britain. I had a file of 7 inch master tapes, and these I copied onto smaller spools. When you joined the tape library you got a spool of your choice (an hour lecture on two tracks of a spool). When you wanted a new tape from the library, you sent your spool back to HASI London, with a small fee, (I think three shillings and sixpence), and I copied the master of your choice onto your spool. Right now I can remember very little of these things, just an impression of the cellar. It was in the front of 37, with the Association Secretary's office at the back, slightly smaller because the stairs were at the back. The dreadful thing about this existence was the weekends. I was miserable at the weekends. At that time I think I was living in Highgate, north of central London, with John Noble. I told him of my problem of misery at the weekends, expecting he would tell me to get auditing. However he did not do that. Instead he suggested that I got a job at the weekends. Earlier I had got half of my auditor training on an evening course. Ron had changed things so that the part time course was at weekends. He had a theory (perhaps for him a certainty) that people trained at the weekends used their training afterwards, but those trained in the evenings did not. So there was at HASI now (then) a weekend HPA Course. The day course was five days a week. The evening course had three weekends equivalent to one week. The standard course at that time was eight weeks (a stable duration for the professional course, kept for many years). On the first week one received a 25 hour intensive from a student (this did not occur when I took my evening course), second and fifth week were Communication Course, third and sixth were Upper Indoc Course (Trs 6 to 9) and fourth and seventh were what was called CCH, where one learned auditing techniques, and the last week one gave a twenty five hour intensive to a student. Each of those three units (Comm Course, Upper Indoc and CCH) had its own instructor (the ban on instructors came later). There was a vacancy for Upper Indoc instructor, and I was that for about eighteen months (later taking on other weekend training hats). Those were good times. There was a very nice, friendly, set of students. We had an hour for lunch and went to local restaurants of which there were many open even at weekends in that part of London. Weekend people were almost completely divorced from the weekday staff. Nominally I came under the Director of Training, who ran the day course, but the instances were we saw him in that eighteen months were very rare. In fact I regard that eighteen months where I taught Upper Indoc at the weekends, as my second great understanding of Scientology - control, mostly, looked at from different angles, with different students. Also getting students to drill through changes, and the changes that occurred. In the autumn of 1958 Ron Hubbard was scheduled to hold an ACC (Advanced Clinical Course) in London - The Fifth London Advanced Clinical Course. I think this was the first ACC which he had held in England. And the Director of Training, Michael Pernetta wanted also to go on the ACC, so it was arranged that I should become Director of Training, a day time job, while I continued the weekend instructor post (during this latter period at weekends) I came to instruct more of the weekend courses. I was Director of Training for a while. The ACC was concerned with running engrams by Scientology, which meant to say by repetitive command, rather than running through them as in Dianetics. Because of the ACC and the need for extra space we hired a building with a large hall at number 7 Fitzroy Street, and here the Academy (the pompous name for the department of training) was placed in the upper floors, and staff were able to attend Ron's lectures every afternoon. Some mornings the directors (about six of us) were invited by Ron into his office where he gave short informal talks which I do not think were recorded. At one of the Briefing Course lectures Ron referred to Academy students as "wound up dolls" which I took great exception to. At one of the talks Ron gave in his office, I remember standing opposite him, and expressing my objections to his statement, something he took calmly and without comment. I can remember there was an occasion when I should choose a new Upper Indoc Instructor. On the day course there were two (leading) candidates, Jenny Parkhouse (wife of Hervie Parkhouse), and Sue Hadfield. As I remember it, Jenny, who had experience as Upper Indoc Instructor, put pressure on me to choose her, but I chose Sue, who was very young and had no Upper Indoc instructor experience. Later Sue left, because her mother Robin Harper got a job at Saint Hill, and I then fell "madly in love" with her, trying to send her flowers (but Saint Hill was out of range of the florist at East Grinstead), and even sending a message to Mary Sue at Saint Hill asking her to intervene on my behalf (poor Mary Sue). While I was director of training, and while the ACC was on, Ron had come into the room, when there was no instructor there, and talked to the students, and asked what confront meant. I have wondered if my Scientology story will ever end!